My head was pounding when I woke up, I knew it wasn’t a good sign. I started getting ready for school and started feeling so nauseous, I was sitting on my cold bathroom floor, hoping that it would go away. I managed to make it to school, but as my kids started coming in, I had trouble keeping my head up. When my students were in chapel, my principal suggested I rest in the nurse’s office. As I laid down on the bed, it felt oddly weird, but comfortable lying down in school on a bed. Afterwards, the nurse gave me some medicine, not sure what it was, but I ate it anyways and picked up my students. 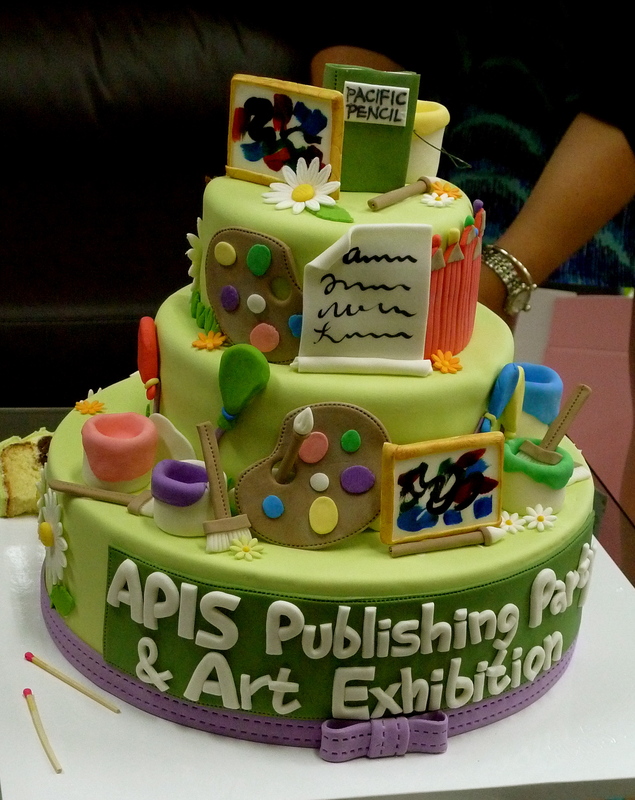 I couldn’t really go home, because we had our literary magazine school wide celebration that afternoon,which I wouldn’t miss no matter how sick I was. As we got back to the classroom from chapel, our room mother was there waiting for us. She brought me the most beautiful flowers and presents for teacher appreciation day! Why don’t they have this holiday in the states? (Or do they?) The actual day is Sunday, so we are celebrating today. 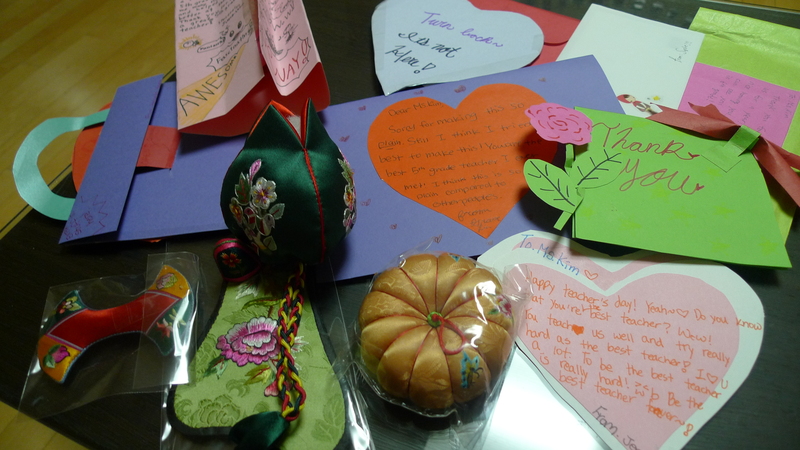 In addition to the flowers and present from the class, my students each made me cards! 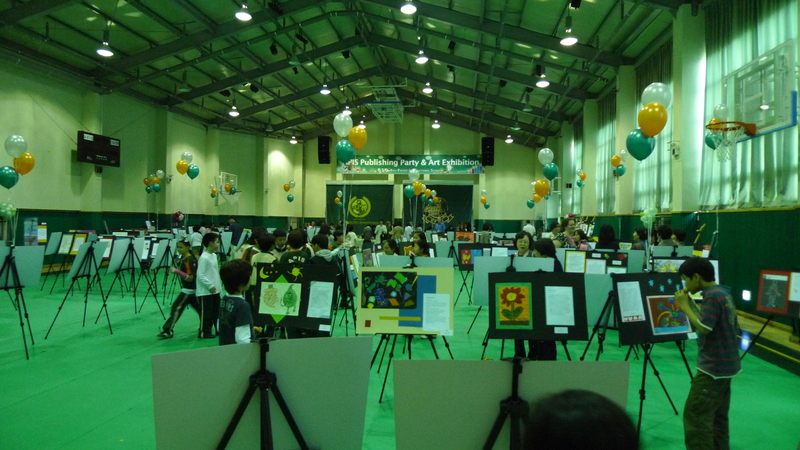 It actually wasn’t much of a surprise, because fifth graders are not good at being secretive. Yesterday, I overhead a number of students talking to one of my students, about giving him the cards and I saw a few students making cards in class. I didn’t say anything to them, because that would be kind of mean, so I pretended to not notice. I mean it was hard not to notice, they kept asking me if they could use the different construction paper. Well, thankfully, I started feeling better after a few periods, and our literary magazine celebration went really well! 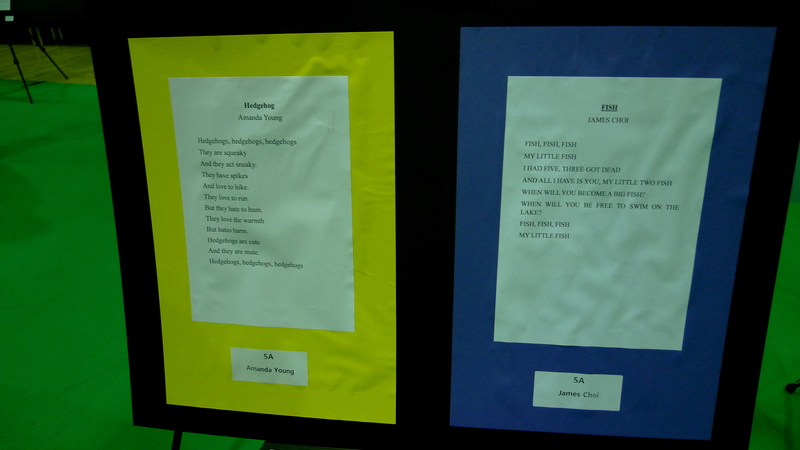 We set up our gymnasium like an art museum and had all the students’ published writing pieces and artwork on display! We also had the author of the Korean book Cloud Bread come in and speak about being a writer. I plan on writing another post about the book Cloud Bread soon! 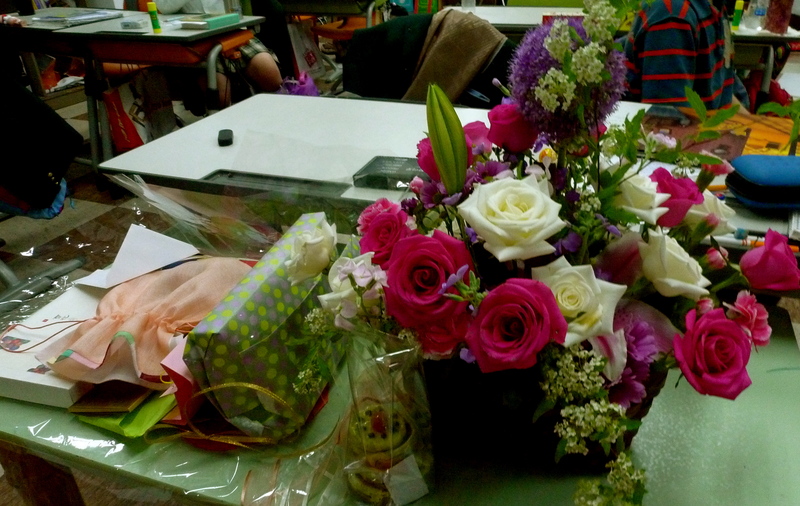 Flowers & presents from my students! 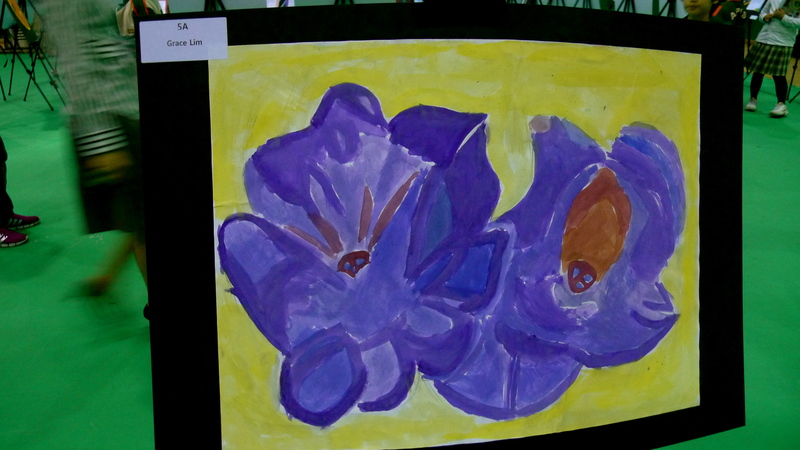 Our art exhibition with student work. Artwork from one of my students! 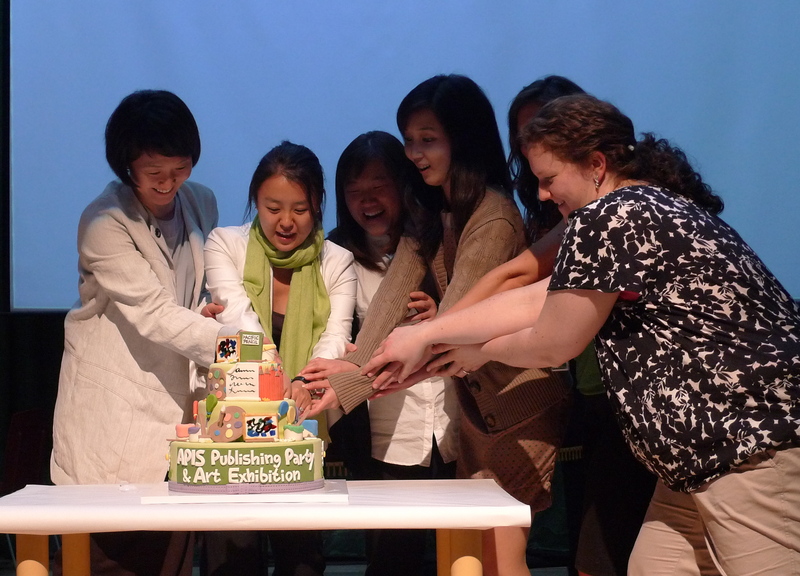 Cake cutting ceremony for the literary magazine.